Once per turn, when your opponent activates a monster effect (Quick Effect): You can target 1 Effect Monster your opponent controls or in their GY; equip that target to this card you control. This card gains ATK/DEF equal to that equipped monster’s. Monsters with that equipped monster’s name cannot attack, also their effects on the field and their activated effects are negated. Millennium-Eyes Restrict is part of the new Pegasus support this year that has yet to hit the TCG. Another monster using Relinquished as a fusion material, you can Fusion Summon this monster with the classic ways, or the new Relinquished Fusion Spell in the same set. Pretty simple to summon in a dedicated deck, instead of absorbing like Thousand Eyes, this monster allows for an equip from the opponents grave once a turn. Few decks don’t activate monster effects during their turn, so your opponent activating a monster effect should be easy to come by. Gains ATK/DEF like Relinquished, but doesn’t have the protection like Relinquished with the attached monster. You can attach more than one target though, and during either players turn this effect can happen. One handy add to this monster is the negation of effect monsters on the field sharing name(s) with attached monsters to this card. If your opponent runs monsters in 3’s this may come up and could be a turning point. Is this better than Thousand Eyes Restrict? That’s up to you and how you want to use it. In a dedicated deck, the support is now there to abuse both monsters, and the new spell is bonkers. The Instant Fusion play still favors Thousand Eyes, but this is easier to bring out than Thousand Eyes. New support for a new week is good. Millennium-Eyes Restrict is a Level 1 Dark Spellcaster-type Fusion Monster with 0 Atk and 0 Def. 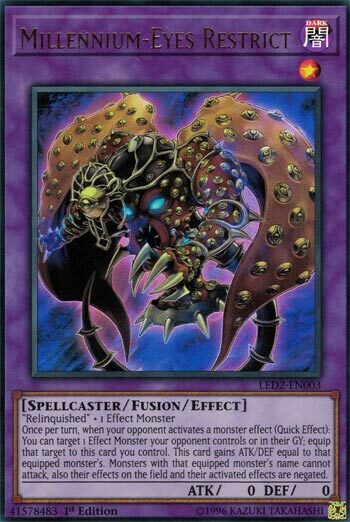 There’s a new Fusion Spell for these new cards and instead of a terrible Normal Monster, This fusion requires Relinquished and any effect monster to Fusion Summon properly. No matter how this card hits the field, its effect can activate during either player’s turn to absorb a targeted effect monster your opponent controls or from their grave. You can only do this after M-ER is on the field and the opponent has activated an effect. It then gains the equipped monster’s Atk and Def. As a small bonus anything equipped to it cannot attack or use their effects on the field so long as they have the same name. If you absorb a monster that the opponent only runs one of then you are out of luck. However, against decks that like to rename themselves (Red-Eyes) this would be very effective. The instant gratification of TER is still better, but M-ER here is necessary in its deck and average overall. I picked some cards this week and opted to go for some of the Legendary Duelists: Ancient Millennium set, starting out with the main card for the Relinquished support, Millennium-Eyes Restrict. Millennium-Eyes is a Level 1 Dark Spellcaster Fusion with 0 ATK and DEF requiring Relinquished and an Effect Monster as materials. Stats are poor no matter what, but he boosts his own ATK and DEF, so it is fine. Type and Attribute are great, Level 1 is rare on a Fusion. The Fusion requirements are easy to fulfill, and Relinquished is actually good so you don’t have to feel bad about playing it. At least it isn’t like Thousand-Eyes where you need Thousand-Eyes Idol. Once per turn, during either player’s turn, when your opponent activates a monster effect, you can equip a monster from their field or GY to this card, this card will gain ATK and DEF equal to the equipped monsters, and your opponent cannot attack with monsters with the same name and their effects are negated. Honestly, a very strong card. Sure it does rely on the opponent using a monster effect, but monster effects in this game are very common, so your opponent might want to kill this before using effects. It gets harder because of cards like Relinquished Fusion and Millennium-Eyes Illusionist using their effects to equip opponent’s monsters to this. Millennium-Eyes is a solid Fusion monster that will be staple in a Relinquished deck. If you want an Instant Fusion target, though, stick to Thousand-Eyes Restrict for that. At least this can have more than one equip though, so more credit to this card. Art: 4.25/5 Not too shabby for having a ton of eyes. Millenium-Eyes Restrict is a very interesting card. As are Relinquished and Thousand-Eyes Restrict. A Fusion of Relinquished, and one Effect Monster, still sporting 0/0 for its own original attack and defense, and still a Level 1 Spellcaster. One thing worth noting and appreciate about MER, is that it can have more than one Monster equipped to it. Absorbing, as it is, via activation of Monster effect IS certainly awesome. Any Monster equipped to this card cannot activate effects, and has their effect(s) negated. Said Monster cannot attack either, so that can be two really disruptive effects toward your opponent. MER has lots going for it, but there’s plenty going against it too. Obviously Monster effects are a huge part of Yugioh, but if you take something your opponent doesn’t have more than one of, all that extra effect there does nothing. You’ve got to take something strong enough to keep this guy on the Field, and protect it…a Fusion is an investment, bigger in some aspects depending on how you actually bring it out. Use wisely. Good card? Yes. Great card? I don’t think so.